About Us | Armchair General Magazine - We Put YOU in Command! Eric Weider is an experienced magazine publisher whose passion is bringing history to life through both print and Web media that engage the reader and provide interactive, decision-making opportunities. Eric’s goal is to make history meaningful to a broad audience, especially to America’s youth. The INTERACTIVE history magazine where YOU decide the course of action! 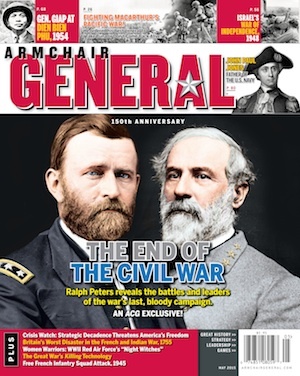 Armchair General (ACG) and ACG online feature a unique, interactive editorial that invites the reader to decide the course of action in challenging historical scenarios, to step into the shoes of a battlefield commander. Leading historians and contributors lend integrity and credibility to this fresh presentation of historical and contemporary events. Free sample PDF of the magazine. Index of past issues, TOC’s, cover shots, and reader surveys. Click here to visit the ACG staff page to learn more about us. Land, naval & air warfare from ancient times to the late 20th century. Military History is the nation’s oldest and most popular magazine devoted to the history of warfare. Each issue contains incisive accounts from top writers and historians who take a fresh look at the commanders, campaigns, battles, and weapons that made history. The leaders, battles, weapons & men who fought in history’s greatest conflict. World War II magazine utilizes dramatic photographs, illustrations, and detailed maps and graphics to bring to life the stories of famous leaders and unsung men and women, the stories of battles and weapons in the world’s greatest conflict, all told by today’s best military history writers. Military History Quarterly covers world history from a military perspective. MHQ contains vivid narrative stories, rare photographs, maps, travel recommendations, and book reviews. It is the ideal companion periodical to Military History magazine. Authoritative, in-depth history of world aviation from its origins to the Space Age. Aviation History offers air enthusiasts the most detailed coverage of the history of manned flight, with action-packed stories and illustrations that put the reader in the cockpit to experience aviation’s greatest dramas. Biographies, battles, eyewitness accounts & period photos of America’s greatest internal conflict. Civil War Times delivers the thrilling, extraordinary history of America’s most deadly internal struggle, from biographies to battle stories, eyewitness accounts to period photographs, plus travel guides, perceptive book reviews and more. Presenting the full & true stories from America’s most controversial & divisive war. Vietnam is the only magazine exclusively devoted to telling the full story behind America’s most controversial war, with gripping firsthand accounts and carefully researched articles by veterans of the conflict and top military historians. Insights into the battles, strategies & leaders with photos, artwork & detailed maps. Lavishly illustrated companion periodical to Civil War Times, America’s Civil War provides insights into the epic conflict that divided the nation for four tragic years. ACW emphasizes battles, strategies and leaders, with detailed battle maps and artwork, including modern and period photographs. The American experience comes alive through writing, outstanding photography & artwork. American History is the leading popular magazine that explores the rich texture of the American experience through engaging writing and outstanding photography and artwork. The magazine’s lively storytelling, thought-provoking essays and more bring America’s past alive in every issue. Travel, history & contemporary life in England, Scotland and Wales. British Heritage is the magazine of travel and life in England, Scotland and Wales, written for those who love Britain. This is a must-read for serious Anglophiles who want to know their way around Britain’s history and landscapes. True history, lore & culture of the great American frontier from its beginnings to today. America’s western frontier has been a vital part of the country’s myths and reality, from the earliest exploration beyond the territory of the first colonies, to the wide expanses of the western prairies and deserts. Wild West brings to life the fascinating history, lore and culture of the great American frontier.